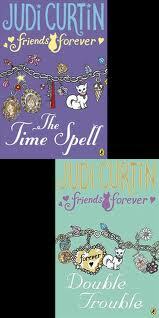 Judi's new series 'Forever Friends' has two books out at the moment, and the first one, 'The Time Spell' takes our new heroine aboard the Titanic. But this is no historical drama... it's about a young girl who finds herself time-travelling. A wonderful story that I can whole-heartedly recommend. In fact, I recommend them both! And don't forget her other new books, Eva's Journey and Eva's Holiday, published by O'Brien Press. Eva is a girl fully enjoying all the prosperity that the Celtic Tiger could afford... but then her family falls on hard times and things take a dramatic turn for her. Timely and great stuff! The third 'Eva' story will be out later this summer. Thanks again, Judi! It was great to see you! 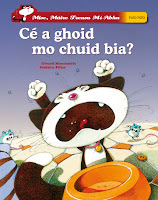 On Monday, 23rd April, Dubray Books' Galway branch played host to the launch of a new series of chapter books as gaeilge by those wonderful publishers Futa Fata (located in Spiddal!) The first two in the series Mise Maire Treasa Mi-Abha have been translated from French; written by Gerard Moncomble, illustrated by Frederic Pillot and translated by Patricia Mac Eoin. The launch of Sin Bronntanas Seafóideach! and Cé a Ghoid mo Chuid Bia was shared with the third class students from Gaelscoil Dara, Renmore. And as the pictures below show you, it was a fantastic morning... with readings, discussions on translation (numerous of the books in Futa Fatas catalogue have been translated into other languages incuding Spanish, Chinese, Japanese, Korean and Scots Gaelic) and a bit of a quiz culminating with several lucky children winning books from the entire range offered by Futa Fata. Just a quick entry to say welcome to all the poets and authors, and all who have come to Galway for the week that's in it. Have a great Cuirt Festival! "This workshop will focus on writing short chapter books for 7-9 year olds. In the past, Futa Fata has had great success with similar workshops. In all, the company has published 6 picture books as a direct result of these workshops, with a number of others to follow later this year. The books have not only done well on the home market but they have also been successful abroad, having been translated and published in China, Korea, Scotland and later this year, South Africa. • A maximum of six places on workshop and successful applicants will be notified by 04th May 2012. The actual workshop will take place over three days, 24th – 26th May in The Twelve Hotel, Barna, Co. Galway. There will be no fee for participation at the workshop and Futa Fata will have the first option on publication of all the stories developed over the three days." Here's a beautiful video for one of the CBI Book of the Year nominees. 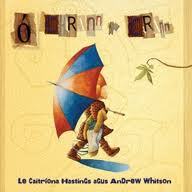 O Chrann Go Crann is wonderfully narrated by Mairead Ni Mhoanaigh from Altan... as gaeilge, of course. For some reason... the blog won't let me upload this from YouTube... so here's the link! Beelicious Recipes With Honey... out now! 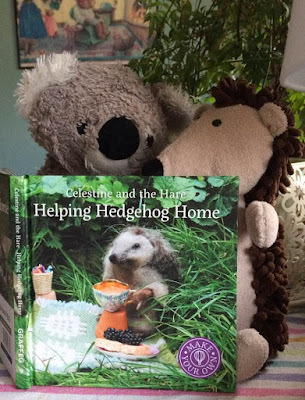 Due to be launched this Sunday (22nd April) and out in your favourite bookshops NOW; a great new cookery book for young children by author Dolores Keaveney (If I Were a Bee and Jenny, the Little Brown Hen) from Mullingar. I was privileged to receive a preview copy and have an early look at Beelicious Recipes With Honey. It's simply delightful in every way, and very useful both to help develop an active interest in healthy eating (and cooking!) in children and in teaching children of all ages about that wonderful, productive and incredibly necessary insect friend; the honeybee. I thoroughly recommend this lovely new cookery book for children... every household should have one! "There’s no doubt about it. Children love to cook. This beautiful new cookery book is just the thing to introduce cooking into their lives. Colourful and joyful illustrations take the whole family on a journey through the kitchen with simple, clear recipes for scones, pancakes, cakes and smoothies that even the youngest can make and enjoy. All made with honey! This book isn’t only a ‘how-to’, though. It is chocked full of interesting information about one of our worlds’ most valuable creatures; the honey bee. We’ve tried a few of them here at home and I’ve got to tell you, the results are satisfying and delicious! 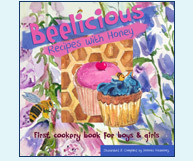 Easy to make, even easier to eat, bright and happy; Beelicious: Recipes With Honey is more than a welcome addition to your cookery book collection. It’s a book that will generate an active interest in nutrition and environment and will promote family togetherness." And here's the link for Dolores' own website where you can learn more about Dolores, her artwork, her books.... everything you need to know! You have just a few days left to get in your nominations for this years' 'Queen of Teen' awards. The nominations end on Friday, 20th April. "Queen of Teen has to be the most glitzy and glamorous award in the world of books, rewarding the nation's favourite authors of teen fiction. The award was founded in 2008 to celebrate the fantastic teen and tween authors who bring so much enjoyment to their readers, dealing with real-life issues in a way that is honest, entertaining and fun!" There's a message from the glorious Cathy Cassidy about her time spent as 'Queen of Teen 2010' and all the fun she's had and what the award has meant to her. Remember, this award is all about what you think... you amazing girl readers! Be sure to click on the link below and get in your nomination for 2012's Queen of Teen. 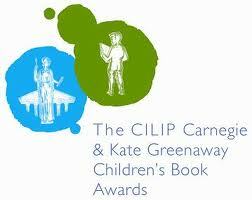 Playing a bit if catch-up with myself here, but I wanted to keep you updated on the UK's most prestigious awards in childrens' literature; the CILIP Carnegie & Kate Greenaway Medals shortlists for 2012. There are exceptional books in both lists (as you might well imagine). The winners of both awards will be announced on 14th June of this year. With such great books shortlisted, I'm really looking forward to finding out who will win! Good luck to them all. 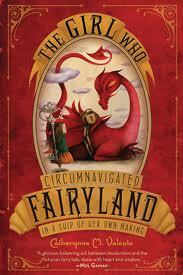 My review of The Girl Who Circumnavigated Fairyland in a Ship of Her Own Making by Catherynne Valente is up now on The Bookbag (thanks, folks!). Seriously, if you only read one book this summer, this has got to be the one! Truly wondrous! There is also an abbreviated version of this review on the page 'What Are You Reading' on this blog. In two days time, the first ever Galway Food Festival begins... four days of food, glorious food and there's even some wonderful events for the kids. I know it's Easter weekend, but that shouldn't stop anyone from joining in the fun. Then run down to the House Hotel for the Kiddies Kitchen.